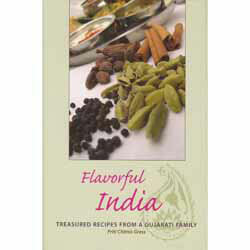 The cuisine of Gujarat, a state in western India, is famed for its delicately flavored vegetarian dishes. Hot, fluffy puri breads are used to scoop up fragrant vegetable curries and dals, seasoned with cumin, coriander and freshly ground garlic and ginger. Kitchdi, the dinnertime staple of rice and lentils, is often topped with Kadhi, a creamy yogurt curry. These dishes are traditionally served on a thaali, a large stainless steel plate containing four to six small bowls, each filled with a different delicacy. On the side, hot, fresh chapatis (flatbreads), pickles, and chutneys complete the meal. This collection of authentic family recipes will introduce you to some of India's most flavorful, yet often overlooked, culinary offerings. The simple, delectable recipes are written for the home cook and adapted to the Western kitchen. An introduction to Gujarati culture, sections on spices, ingredients, utensils, and charming line drawings by the author's father bring the flavors of India to life. "Dear Spices of India, Super fast delivery, very happy with all products ...thumbs up for Spices of India."